Project Learning Tree has published a new set of activities designed to engage middle and high school students in STEM (science, technology, engineering, and math) as they calculate the economic and environmental benefits of trees. Students input data they collect into a free online tool that calculates the dollar value of the benefits provided by a tree, or a set of trees. Produced in collaboration with the U.S. Forest Service (USFS), three easy-to-do, hands-on lessons accompany i-Tree Design, a suite of free online tools developed by USFS and its partners, to help students discover and analyze the many ecosystem services that trees provide. The activities can be used in formal classroom settings or with nonformal groups, such as scouts and students enrolled in afterschool programs. 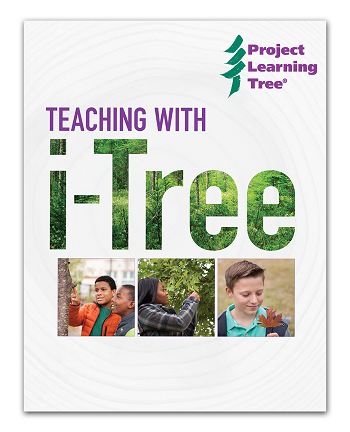 Download PLT’s Teaching with i-Tree unit. Evaluate competing design solutions to a complex real-world problem. Develop and give informative scientific presentations on their findings. How Does i-Tree Design Work? Input your location and the tree species, circumference, and condition. 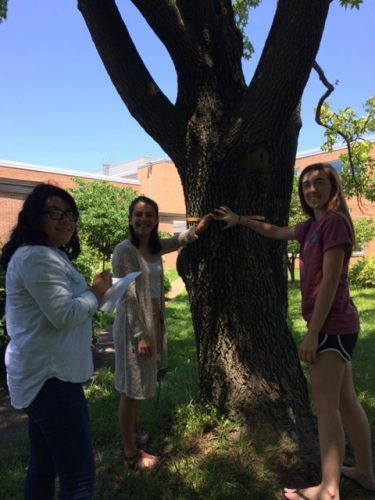 High school students at George C. Marshall high school in Falls Church, Virginia pilot test PLT’s Teaching with i-Tree activities. PLT’s Teaching with i-Tree unit contains three hands-on and fun activities that teachers can use in conjunction with i-Tree Design to stimulate students’ critical thinking and problem solving. As with all PLT activities, they are designed to move the student from awareness and knowledge to challenge and action. The activities provide a structured alignment to Next Generation Science Standards and the Common Core State Standards for English Language Arts. In Activity 1, Tree Benefits and Identification, students identify trees using free apps and online tree guides. They discover the products we obtain from trees, how we depend on trees in our daily lives, and the value that trees provide to their community and the environment. In Activity 2, Tree Value, students identify, measure, and assess the health of trees. They calculate the dollar value and ecosystem services of the trees using the i-Tree Design software and create an Ecosystem Services Guide for their study site. They generate a tree improvement action plan and, if feasible, implement part or all of it. In Activity 3, Land Manager Role Play, students are challenged to apply what they’ve learned as they role-play being land managers. They gain skills in communicating and presenting scientific information. They also learn about a variety of forest-related careers. Teachers who have used these activities have provided positive feedback. “Very cool program,” said Jane Houseal with the Arkansas Master Naturalists. “This is something we can actually use with real-world application,” said Patti Farris, a science teacher at Ramsey Jr. High in Ft. Smith, Arkansas. Help us spread the word with this flyer!